Those poor leprechauns, a type of fairy in Irish folklore, already have a bad reputation to add pinching to their mischief repertoire. They are just little old men, wearing a coat and hat that yes, enjoy a little mischief here and there. Solitary creatures who spend their time making and mending shoes and have a hidden pot of gold at the end of the rainbow. If captured by a human, the leprechaun has the magical power to grant three wishes in exchange for their freedom. On St Patrick’s Day in Ireland, it is customary to wear shamrocks and/or green clothing or accessories known as the “wearing of the green”. The color green has been associated with Ireland since at least the 1640s, when the green harp flag was used by the Irish Catholic Confederation. The phrase “wearing of the green” comes from a song of the same name, which laments United Irishmen supporters being persecuted for wearing green. Saint Patrick’s Day or the Feast of Saint Patrick is a cultural and religious celebration held on March 17th, the traditional death date of Saint Patrick, the foremost patron saint of Ireland. The day commemorates Saint Patrick and the arrival of Christianity in Ireland and celebrates the heritage and culture of the Irish in general. Celebrations generally involve public parades and festivals. Christians also attend church services and the Lent restrictions on eating and drinking alcohol are lifted for the day, which has encouraged and propagated the holiday’s tradition of alcohol consumption. When St. Patrick was about 16, he was captured by Irish pirates from his home in Britain, and taken as a slave to Ireland, where he lived for six years before escaping and returning to his family. After becoming a cleric, he returned to northern and western Ireland. 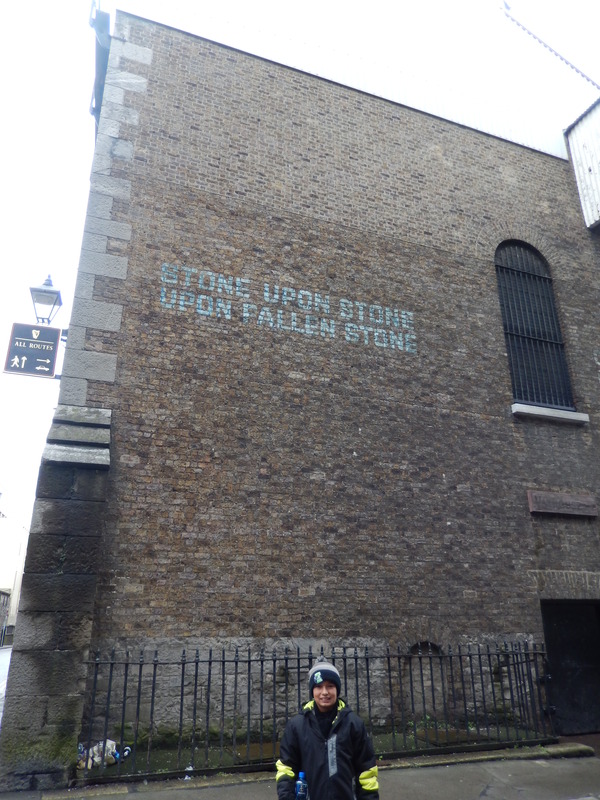 By the seventh century, he had already come to be revered as the patron saint of Ireland. St Patrick is said to have used the shamrock, a three-leaved plant, to explain the Holy Trinity to the pagan Irish. 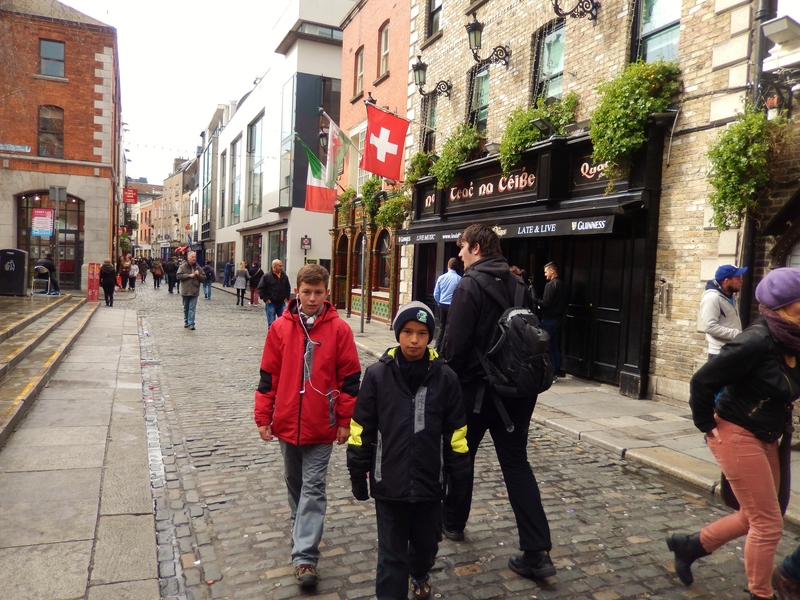 We arrived in Dublin two days after St Patricks Day. 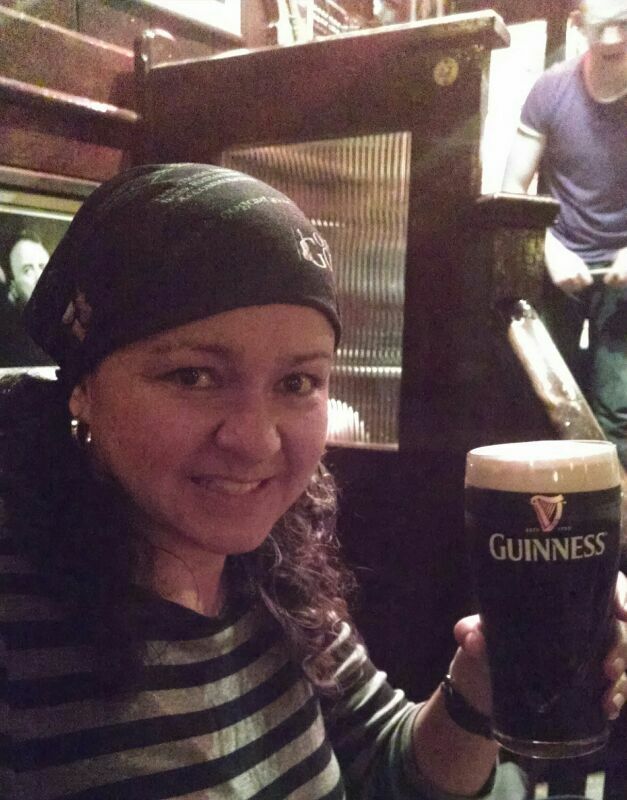 Although the celebration was over, we had to have a very Irish drink and celebrate anyway. 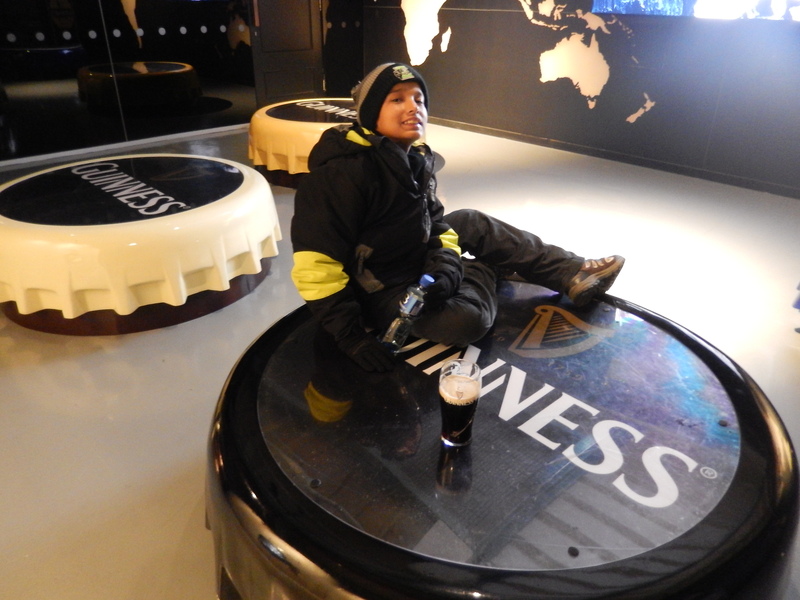 So on our very first day we decided to go to the Guinness Storehouse. 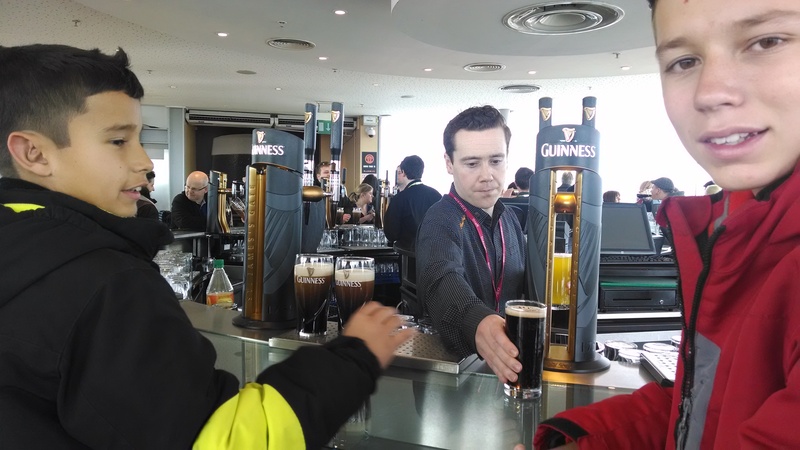 What is more Irish than Guinness Beer? The building in which the Storehouse is located was constructed in 1902 as a fermentation plant for the St. James’s Gate Brewery (where yeast is added to the brew). 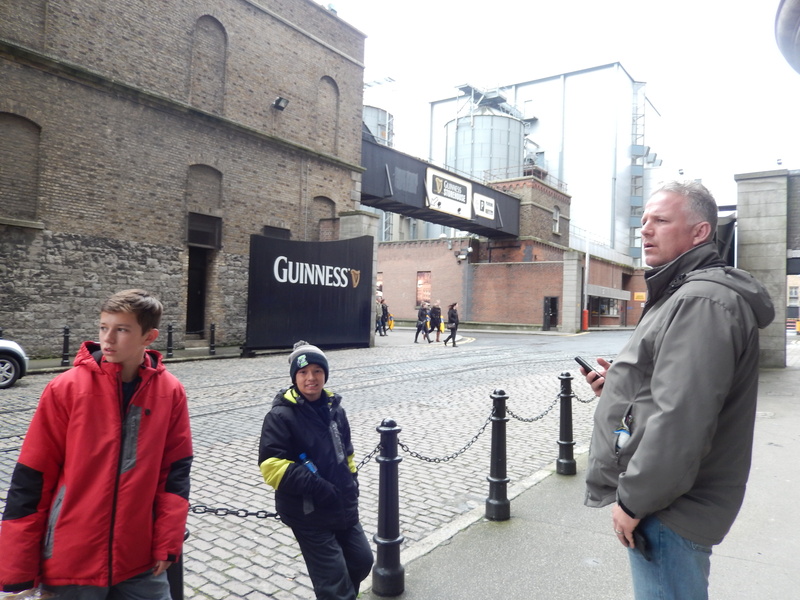 In 1997, it was decided to convert the building into the Guinness Storehouse, replacing the Guinness Hop Store as the Brewery’s visitor centre. 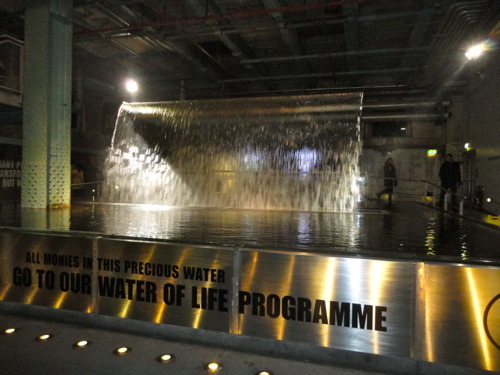 It opened to the public on December, 2000. It was the last couple of winter days and it was still very cold. 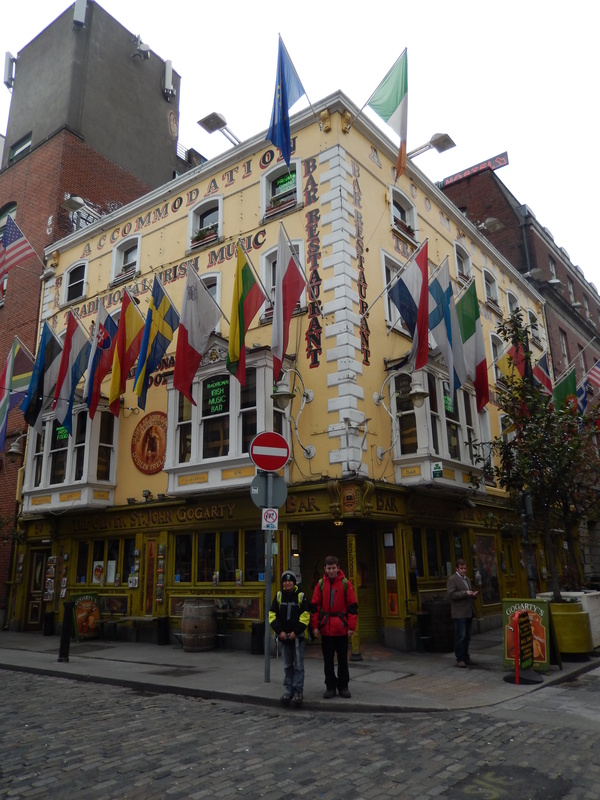 The image I had of Dublin was exactly this. And I loved it! 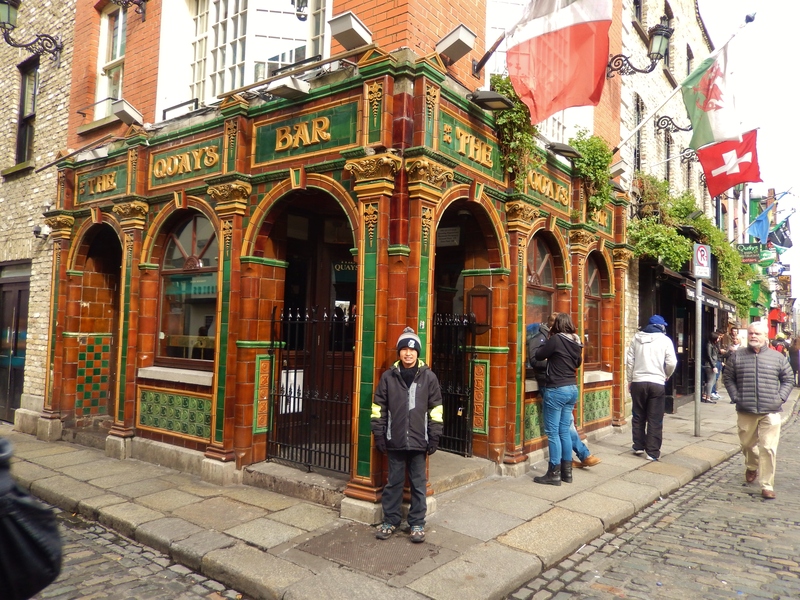 It was time to learn about the very famous Guinness beer, the Irish dry stout that originated in the brewery of Arthur Guinness (1725–1803). It is one of the most successful beer brands worldwide. It is brewed in almost 60 countries and is available in over 120. Its main feature is the burnt flavour that is derived from roasted unmalted barley. The draught beer’s thick, creamy head comes from mixing the beer with nitrogen when poured. 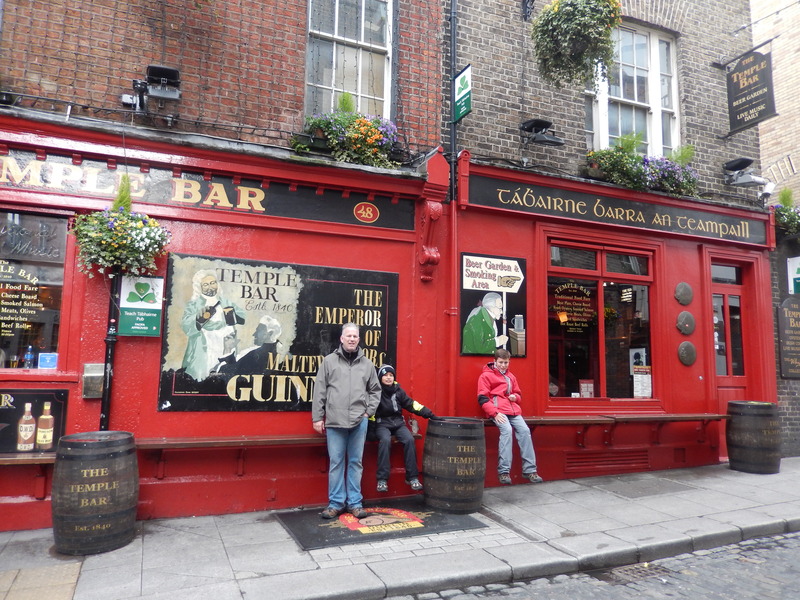 It is popular with the Irish both in Ireland and abroad and it is still the best-selling alcoholic drink in Ireland. 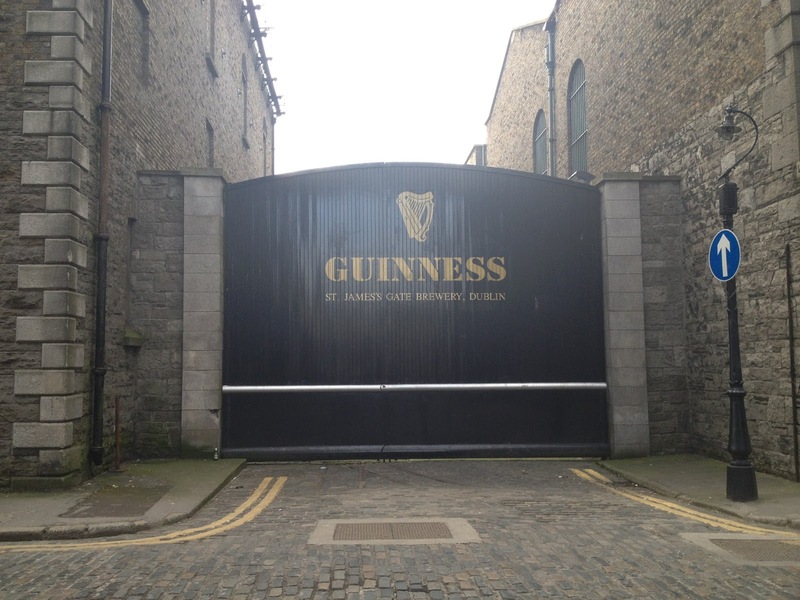 Arthur Guinness started brewing ales from 1759 at the St. James’s Gate Brewery, Dublin. On 31 December 1759 he signed a 9,000 year lease at £45 per annum for the unused brewery. 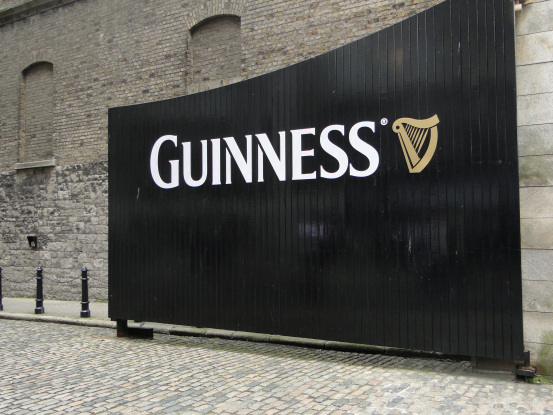 Ten years later, on 19 May 1769, Guinness first exported his ale: he shipped six-and-a-half barrels to Great Britain. 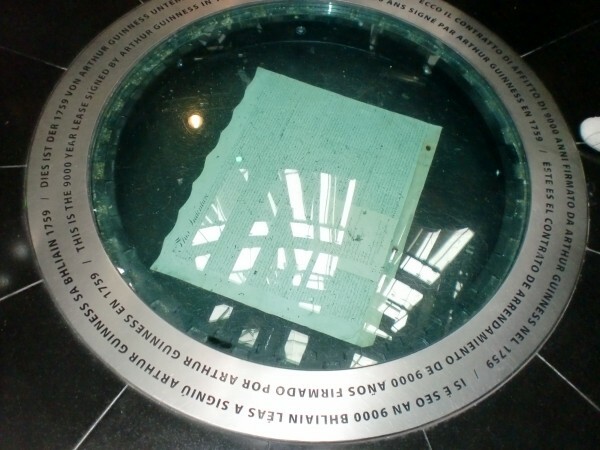 You will find the original document on the floor of the main atrium. 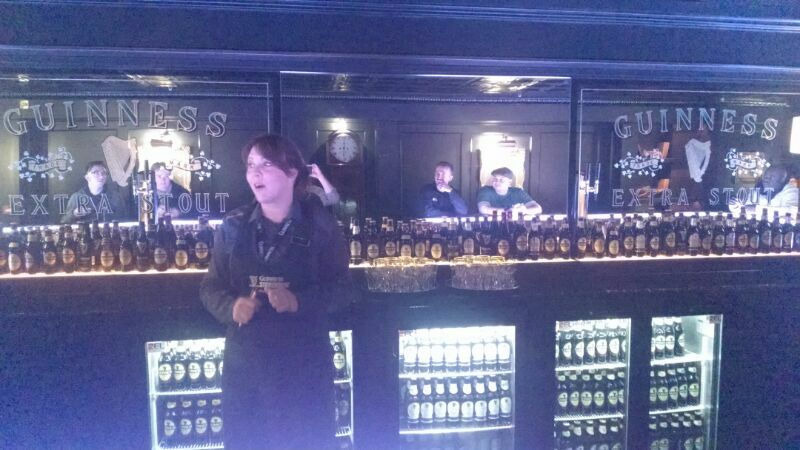 The Storehouse has seven floors surrounding a glass atrium shaped in the form of, you guessed it, a pint of Guinness.The ground floor introduces the beer’s four ingredients (water, barley, hops and yeast), and the brewery’s founder, Arthur Guinness. 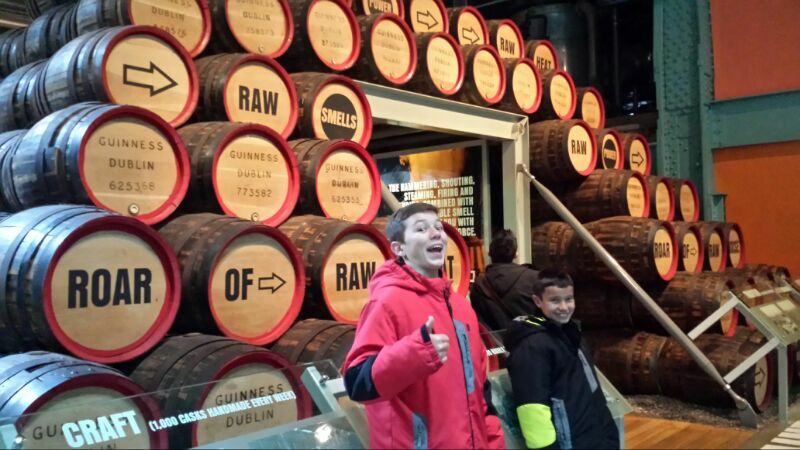 There are all sorts of exhibits and displays that describe everything from raw materials, the process, the finished products, the marketing behind the Guinness brand and an interactive exhibit on responsible drinking. 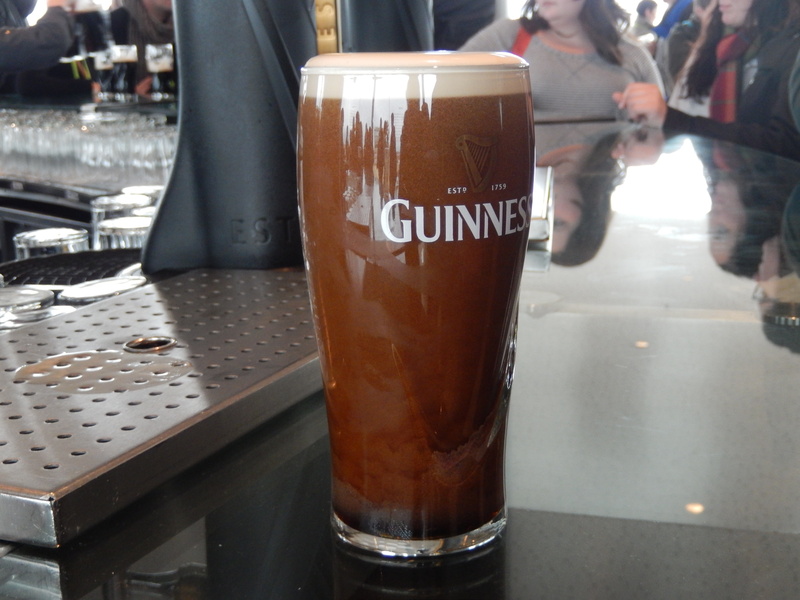 Guinness stout is made from water, barley, roast malt extract, hops, and brewer’s yeast. 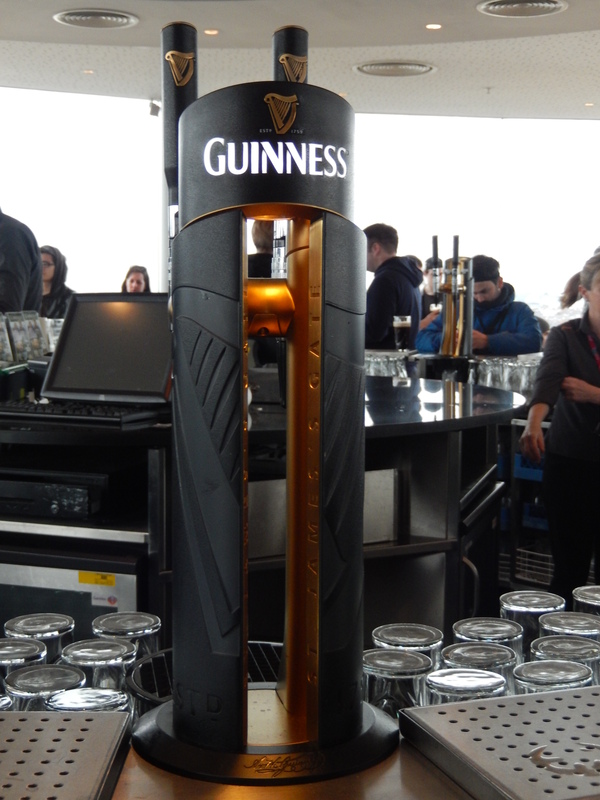 A portion of the barley is roasted to give Guinness its dark colour and characteristic taste. It is pasteurised and filtered. 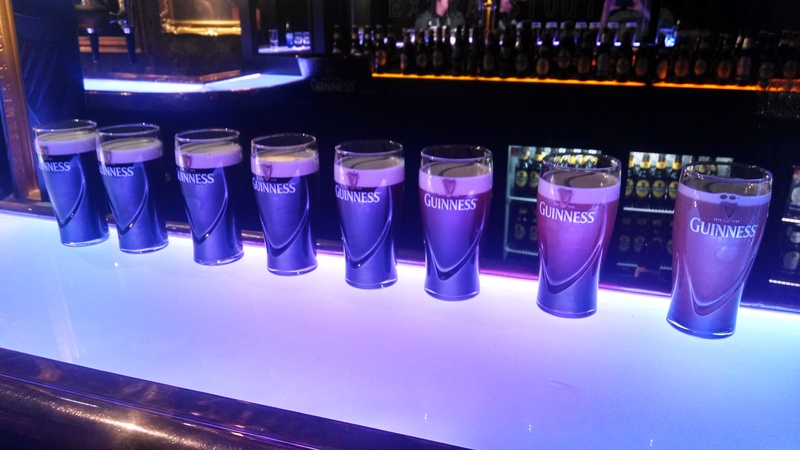 Despite its reputation as a “meal in a glass”, Guinness only contains 198 kcal, slightly fewer than skimmed milk, orange juice, and most other non-light beers. 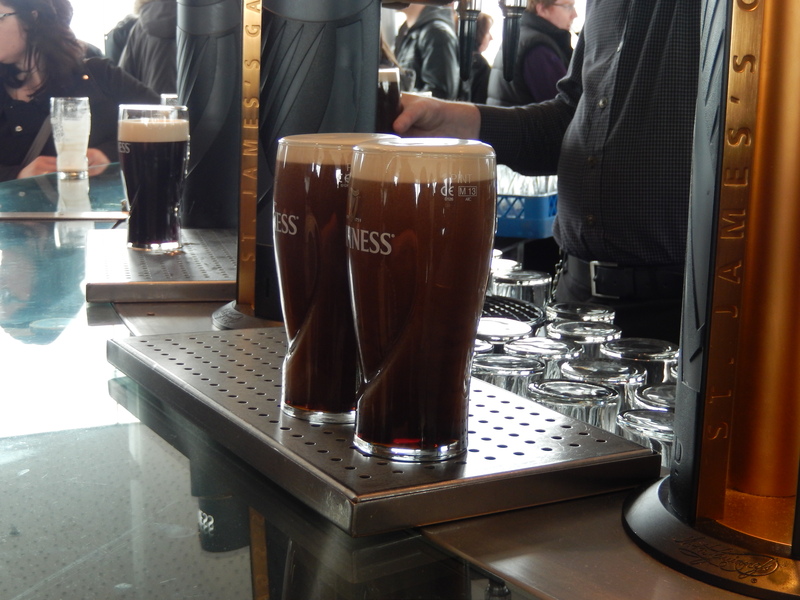 Studies claim that Guinness can be beneficial to the heart. Researchers found that “‘antioxidant compounds’ in the Guinness, similar to those found in certain fruits and vegetables, are responsible for the health benefits because they slow down the deposit of harmful cholesterol on the artery walls.” This is great news for everyone, everywhere! 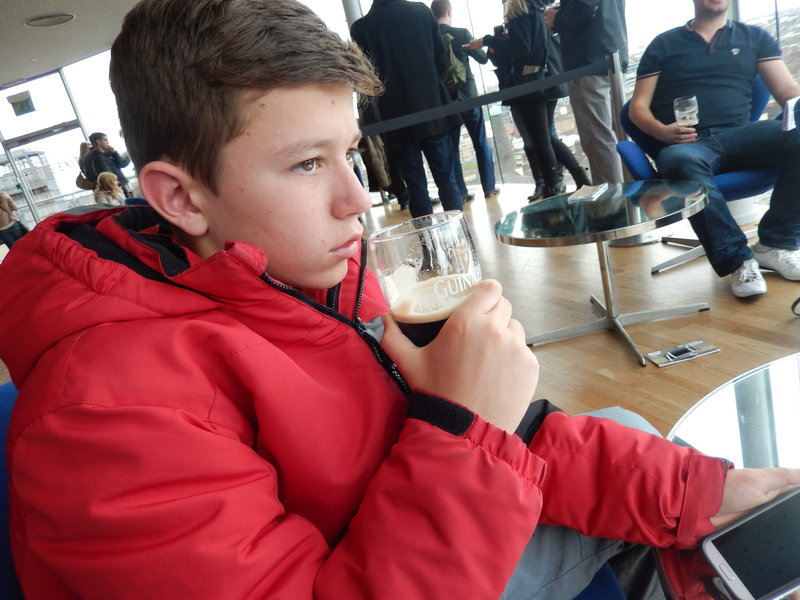 After acquiring all that knowledge, it was time to go up to the seventh floor to the Gravity Bar, an ultra modern space with amazing panoramic views of Dublin and where visitors may drink a pint of Guinness included in the price of admission. 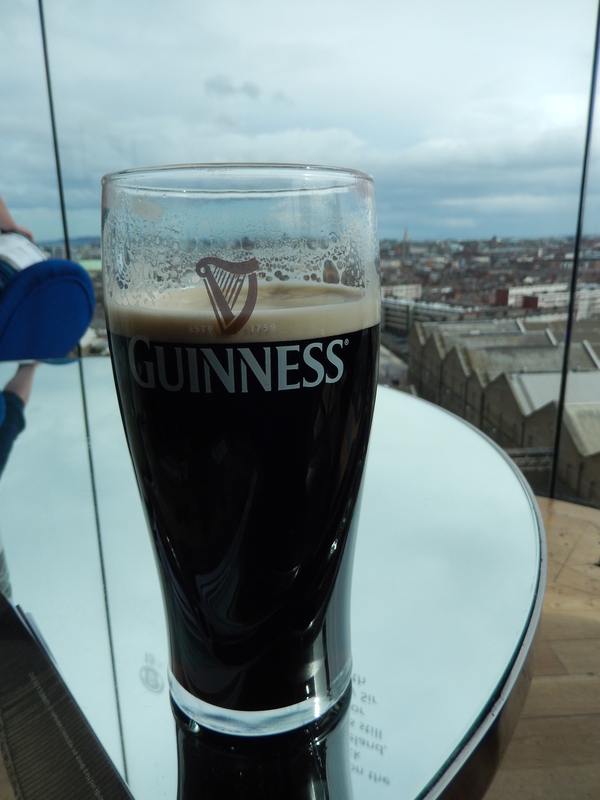 Wayne signed up for the Connoisseur Experience (a more in depth hands on session about the beers), so we needed to make time and what a better way to pass time than to be sipping a perfect pint by the window overlooking Dublin. Dante got us some chairs while we went to the bar to collect our beers. To begin the pour, the server holds the glass at a 45° angle below the tap and fills the glass 3/4 full. On the way out of the tap, the beer is forced at high speed through a five-hole disc restrictor plate in the end of the tap,creating friction and forcing the creation of small nitrogen bubbles which form a creamy head. After allowing the initial pour to settle, the server fills the remainder of the glass until the head forms a slight dome over the top of the glass. 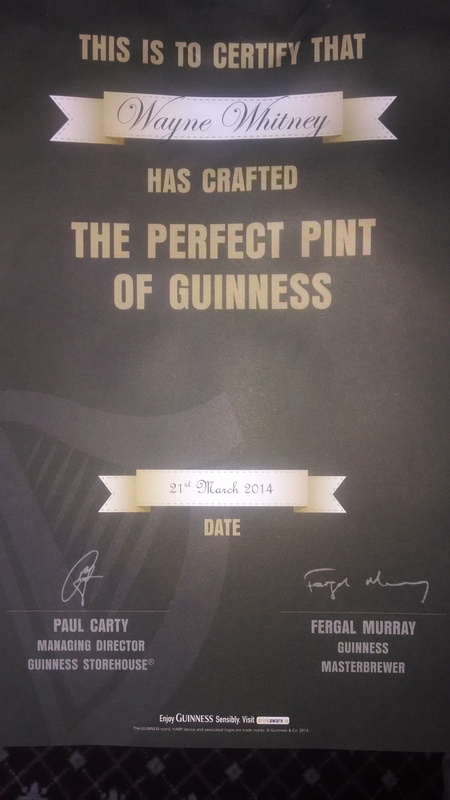 The “perfect pint” of Draught Guinness is the product of a “double pour”, which according to the company should take 119.5 seconds.Guinness has promoted this wait with advertising campaigns such as “good things come to those who wait”. 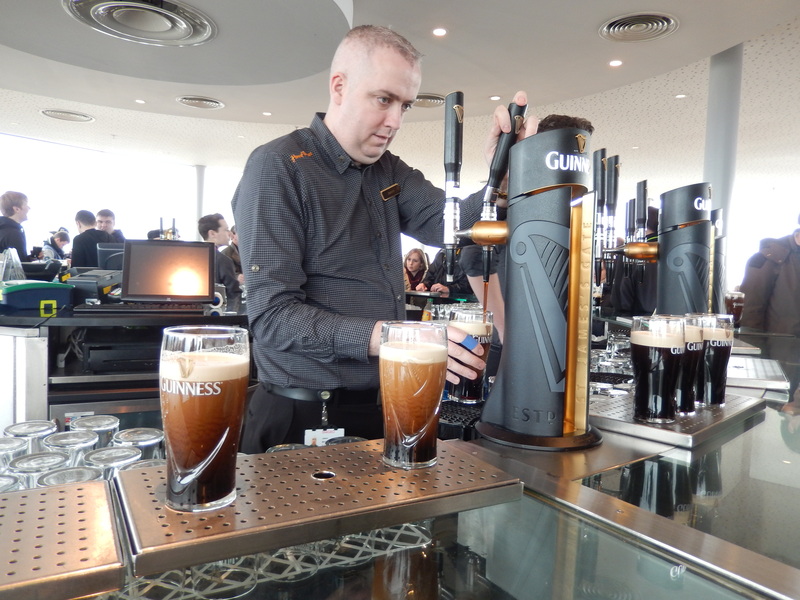 The brewer recommends that draught Guinness should be served at 6 °C (42.8 °F), while Extra Cold Guinness should be served at 3.5 °C (38.6 °F). 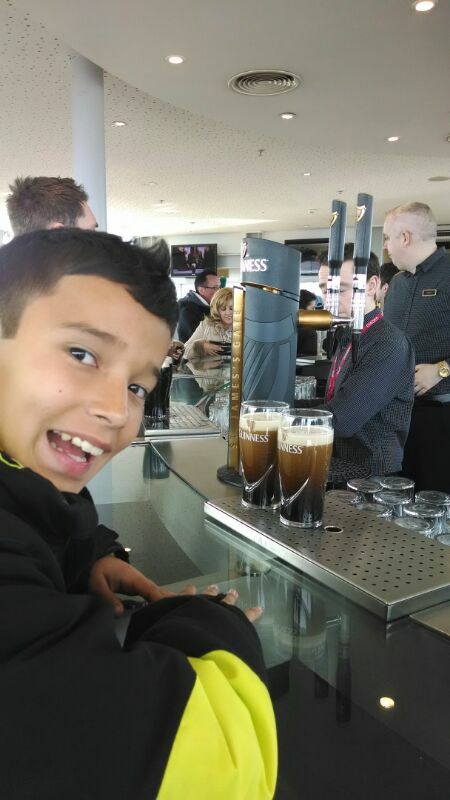 A pint of Guinness should be served in a slightly tulip shaped pint glass, since it helps with the flow. Before someone calls CPS, Vincent is JUST smelling the beer. We soon sent the boys for the next round. 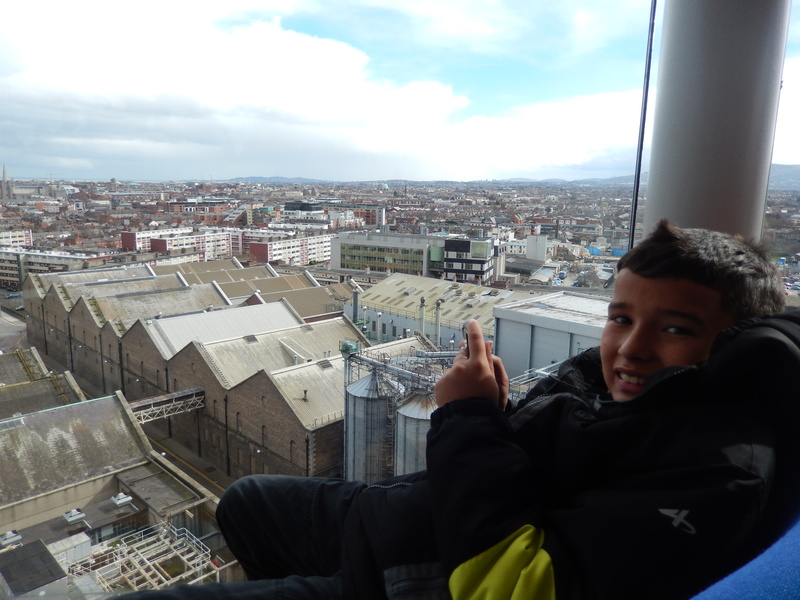 Then it was time for Wayne to go to his Connoisseur Experience so the boys and I went down to the fifth floor to eat at the Brewery Bar. 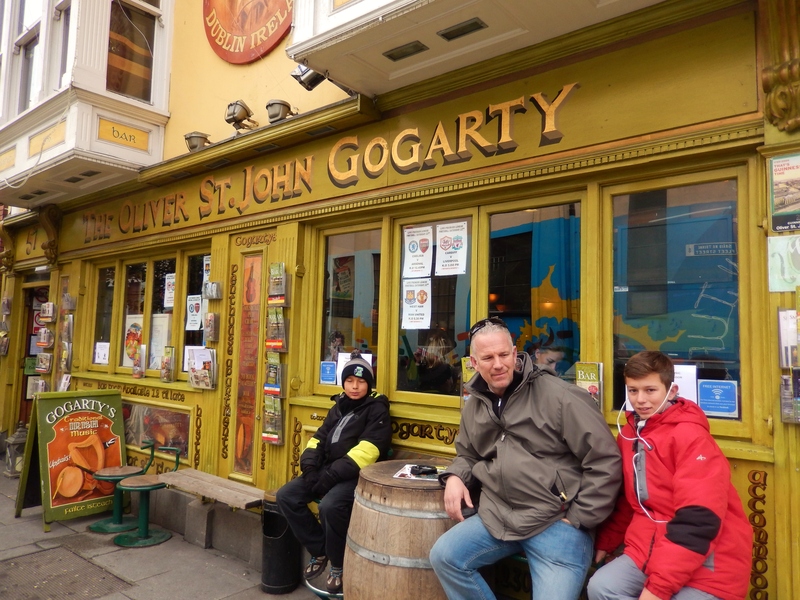 We had some amazing Irish cuisine. 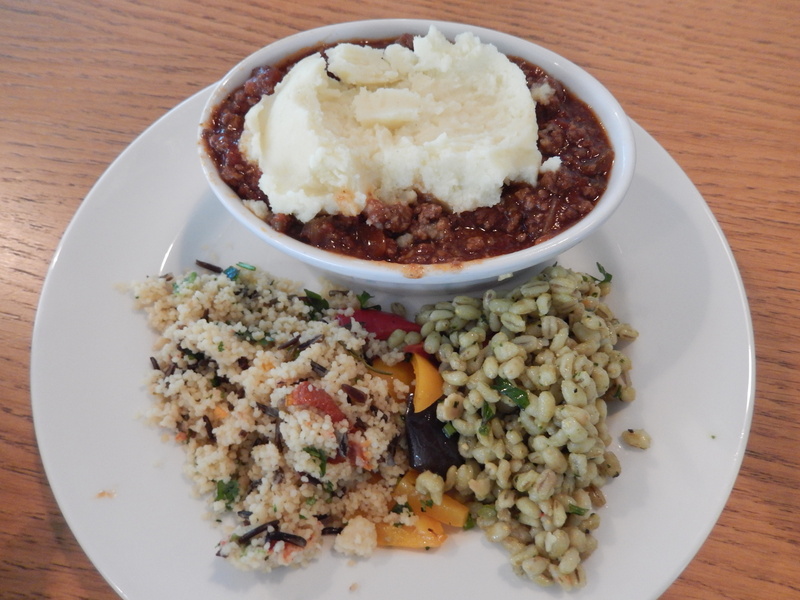 They use Guinness both in the cooking and as an accompaniment to food. It was delicious! 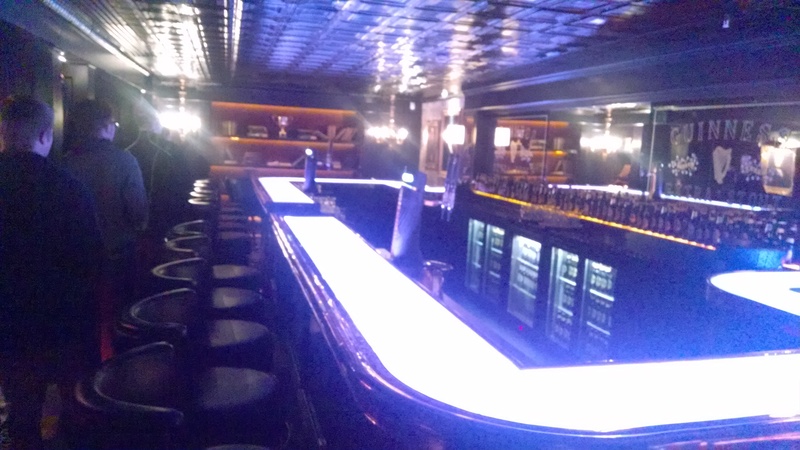 Meanwhile, Wayne was ushered into a secret ‘hidden bar’ which offers true Guinness fans and beer aficionados a premium cosy space to get under the skin of Guinness’s four main variants – Guinness draught, Guinness Original, Foreign Extra Stout and Guinness Black Lager – in an intimate tutored tasting session. 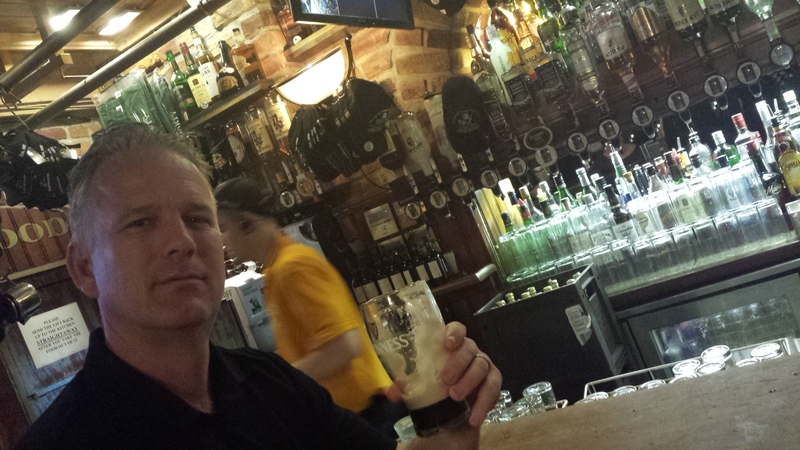 Wayne learned how to pour the perfect pint. And he even got a certificate! It was a great experience! 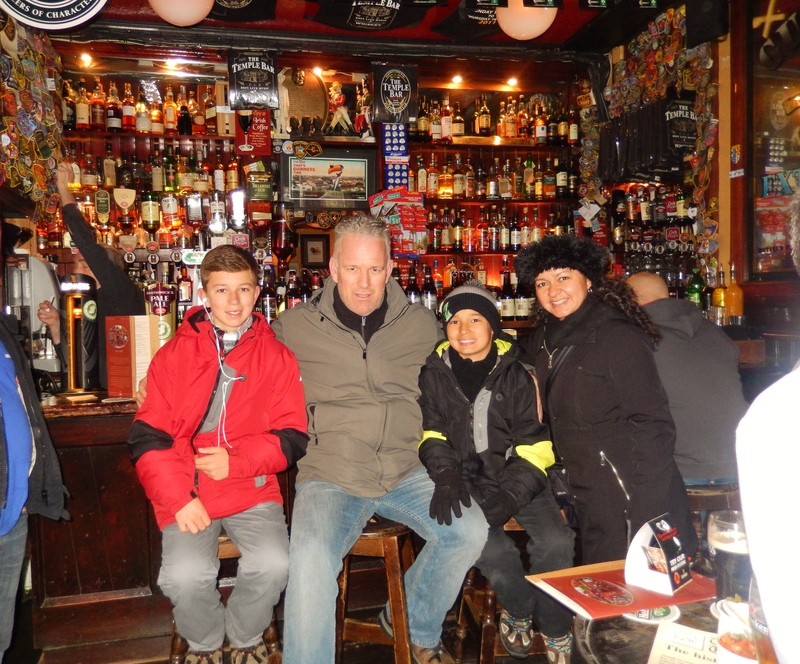 We went on to drink many more Guinness pints in all the various pubs during our fabulous stay in Dublin. While listening to some awesome Irish folk music and the most cool Irish vibe called ‘Craic’, you can’t help but love this city, this culture and it’s people. So today, in honor of St. Patricks Day, the boys dressed in green and Wayne and I will indulge in some Guinness deliciousness. 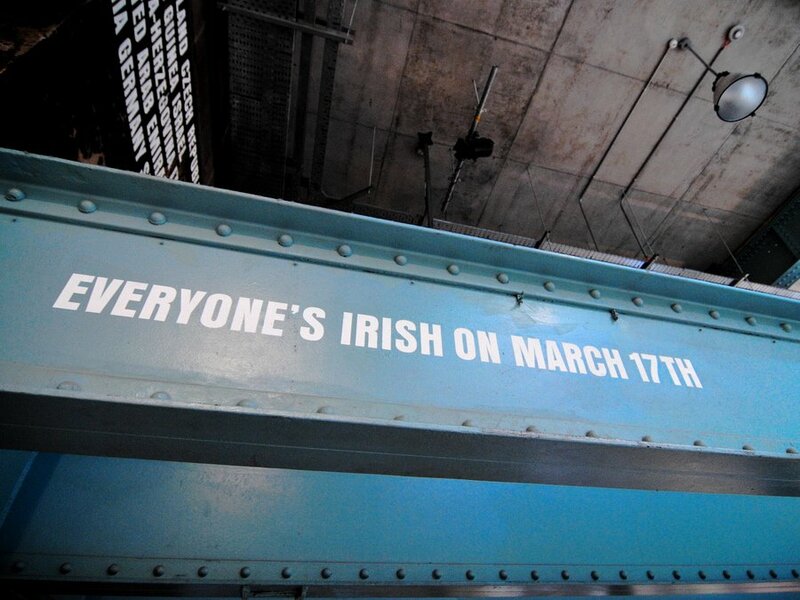 After all, everyone’s Irish on March 17th. Previous Previous post: Paris, the City of Lights, the City of Love and also, the city where the ‘3 second rule’ does NOT apply. 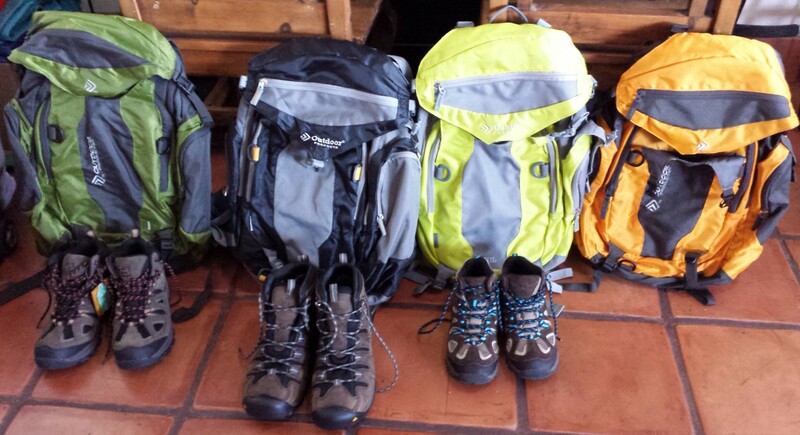 Next Next post: My interview with Erik Hemingway from Family Adventure Podcast.